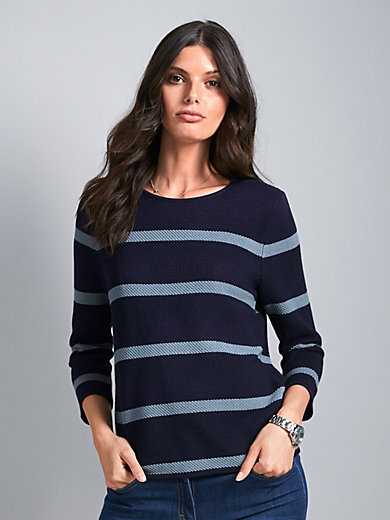 Round neck jumper by PETER HAHN with 3/4-length sleeves. First class fabric: skin-pampering, shape-retaining, simply wonderful! A mix and match item suitable for year-round wear, which looks particularly beautiful with jeans outfits. In waffle stitch with stripes made of long-stapled SUPIMA® cotton from the sunny, southern states of the USA. 100% cotton. Length approx. 24ins. The round neck jumper is machine washable.